We have just arrived in Auckland from the UK visiting friends Annette and Steve and have been invited to ride with ACTA on this Wednesday outing. Fun for us to see what club riding here is all about, and to compare differences with our own CTC and Tandem Club rides back home. Do I detect we are also being put to the test? We arent doing too badly although being hot off the plane and nursing bad colds we probably arent at our best. and those scones and cakes look pretty good too! 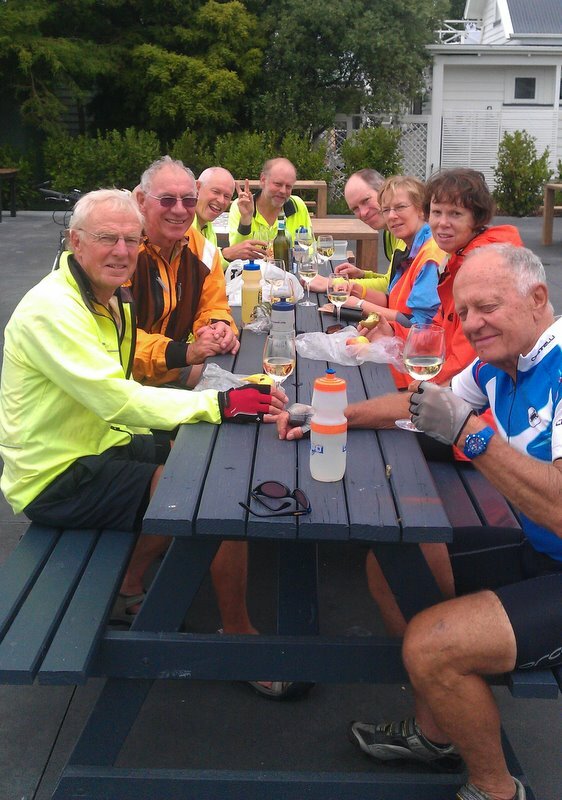 As the group gathers in the café in Kumeu, having ridden from near and far to join the ride, we are introduced to Glen, Ron, Dave, Rambo, Tony, Judy and Gaye. We are soon kitted out with fluorescent jackets and away with everyone chatting amiably along the way. Its green with mostly quiet lanes and plenty of hills on this figure of eight ride to Muriwai Beach and back, with a pause to view the gannet colony. Next up - black sand on the surfers beach and lovely fluting birdsong from the pohutakawa in full flower for Christmas. Time for another cup of coffee. Verna considers the fact that Rambo has eyes in the back of his head. Steve and Tony setting the world to rights, or discussing the quality of the coffee. Then we truly depart from CTC traditions, for it turns out to be Tonys birthday. We would normally have a pub lunch on our rides but not in New Zealand. We all cycle into the winery at Matua and unfold our picnic lunches sitting outside in increasing amounts of sunshine while Tony generously goes to the bar for two bottles of wine to drink with our meal. I could get used to this life. Another novelty for us is the section of gravel road. Good practice for us as we will undoubtedly encounter more roads like this during our stay. Thank you all for a lovely day out.